This is the Stronghold Games edition of this classic game, originally released by TimJim Games. As a Commander on a remote Outpost, your mission is to build and expand your colony to its fullest. Purchase Factories and run them with either Humans colonists or Robots. Produce resources from your Factories to generate credits to continue to expand your Outpost. Bid on the all-important Colony upgrades on your way to becoming The Outpost Director! As Commanders, the players compete to build the best Outpost on this remote world. They must build and staff Factories to produce resources, which are in turn are used to build additional, more lucrative Factories, as well as to purchase any of the 13 Colony Upgrades as they become available. The Colony Upgrades provide various advantages ranging from production technologies, resource storage, increased population maximums, and other scientific breakthroughs. These improvements are purchased through auctions, which are highly competitive, since there are fewer Colony Upgrades available than the number of players. There are 3 phases in the game, and with each phase after the first a new set of these improvements are available to bid on. Each staffed Factory and improvement is worth a certain number of victory points (ranging from 1 VP for an Ore Factory to 20 VPs for a Moon Base). 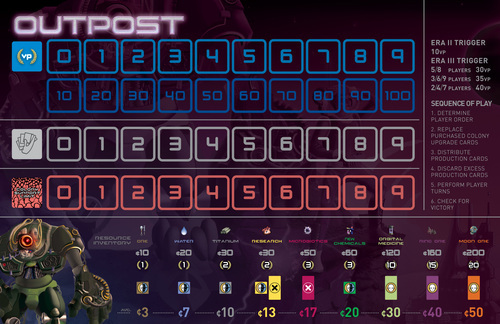 The Commander that reach 75 victory points gains the title of Outpost Director and wins! 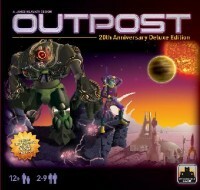 Add a Review for "Outpost: 20th Anniversary Edition"